Excitatory effects of human immunodeficiency virus 1 Tat on cultured rat cerebral cortical neurons. Human immunodeficiency virus 1 (HIV-1) Tat protein is one of the neurotoxins involved in the pathogenesis of HIV-1-associated neuronal disorders. Combined electrophysiological and optical imaging experiments were undertaken to investigate whether HIV-1 Tat30-86, herein referred to as Tat30-86, acted directly or indirectly via the release of glutamate or both and to test its effect on the properties of spontaneous quantal events in cultured cortical neurons. Whole-cell patch recordings were made from cultured rat cortical neurons in either current- or voltage-clamp mode. Tat30-86 (50-1000 nM) induced in a population of cortical neurons a long-lasting depolarization, which was accompanied by a decrease of membrane resistance and persisted in a Krebs solution containing tetrodotoxin (TTX, 0.5 microM). Depolarizations were slightly reduced by pretreatment with glutamate receptor antagonists 6-cyano-7-nitroquinoxaline-2,3-dione (CNQX) (10 microM) and d-2-amino-5-phosphonovaleric acid (AP-5) (50 microM), and were markedly reduced in a Ca(2+)-free Krebs solution; the differences were statistically significant. Tat30-86-induced inward currents had a reversal potential between -30 and 0 mV. While not causing a noticeable depolarization, lower concentrations of Tat30-86 (10 nM) increased membrane excitability, as indicated by increased numbers of neuronal discharge in response to a step depolarizing pulse. Tat30-86 (10 nM) increased the frequency of spontaneous miniature excitatory postsynaptic currents (mEPSCs), while not significantly affecting their amplitude. Tat30-86 (10 nM) moderately increased the frequency as well as the amplitude of spontaneous miniature inhibitory postsynaptic currents (mIPSCs). Ratiometric Ca(2+) imaging studies showed that Tat30-86 produced three types of Ca(2+) responses: 1) a fast and transitory increase, 2) Ca(2+) oscillations, and 3) a fast increase followed by a plateau; the glutamate receptor antagonists eliminated the late component of Ca(2+) response. The result suggests that Tat30-86 is an active fragment and that it excites cortical neurons directly and indirectly via releasing glutamate from adjacent neurons. Brailoiu GC, Brailoiu E, Chang JK, Dun NJ. Excitatory effects of human immunodeficiency virus 1 Tat on cultured rat cerebral cortical neurons. Neuroscience. 2008;151(3):701-10. Depolarizations of cultured rat cortical neurons by Tat30-86. A, Tat30-86 (50 nM) applied by superfusion produced a small membrane depolarization with no detectable changes in membrane resistance. The broken line denotes resting membrane potential. B, a higher concentration of Tat30-86 (500 nM) produced a long-lasting depolarization accompanied by intense discharge and a marked decrease in membrane resistance. 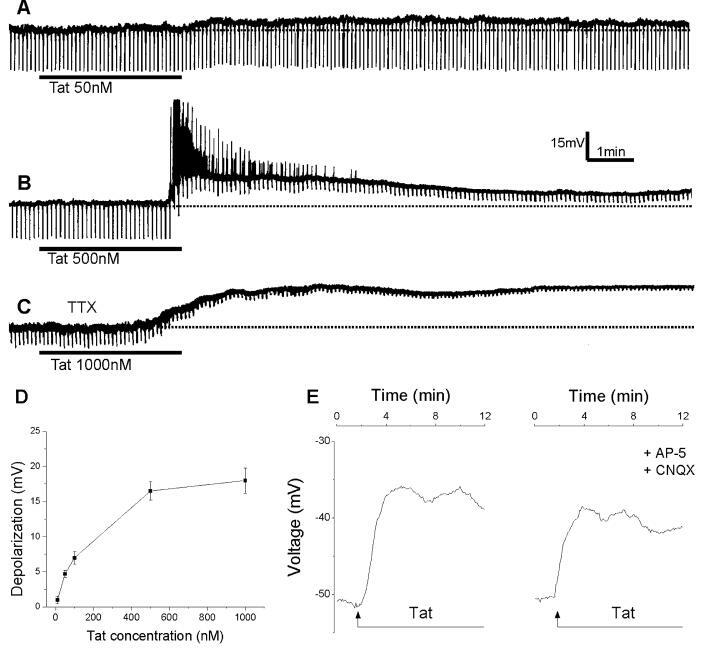 C, Tat30-86 (1000 nM) induced a long-lasting depolarization in a neuron pretreated with tetrodotoxin (TTX; 0.5 μM). A, B and C represent actual recordings from three different neurons. Downward deflections superimposed on the membrane potential are hyperpolarizing electrotonic potentials induced by constant current pulses (30 pA, 300 ms) and are used to monitor membrane resistance changes. D, concentration-response relationship of Tat-induced depolarizations; data points represent mean ± S.E. of 3-6 neurons. E. Depolarizations of cerebral cortical neurons induced by Tat 30-86 as monitored by optical imaging using DiSBAC4(3); the depolarization is slightly reduced by pretreatment with AP-5 and CNQX; recordings are from two different neurons. Neuronal excitability increase by Tat30-86. A, a cortical neuron discharged 4 action potentials in response to a step depolarizing current pulse (30pA, 500ms, not shown). Tat30-86 (10 nM) increased the number of action potentials to 8 in response to the same depolarizing stimulus (lower panel). B, stimulus-response curves obtained before and after perfusion of 10 nM Tat (n=4); * denotes P<0.05. Comparison of Tat30-86-induced responses of rat cerebral cortical neurons in normal Krebs and Ca2+-free Krebs. A, superfusion of Tat (500 nM) produced a membrane depolarization accompanied by a small decrease in input resistance. B, this neuron was perfused with Ca2+-free Krebs solution for 5 min prior to administration of Tat30-86. C, normalized Tat-induced depolarizations in normal Krebs solution (control, n=4) and Ca2+-free Krebs solution (n=4). Asterisk indicates a statistically significant difference (P< 0.05). 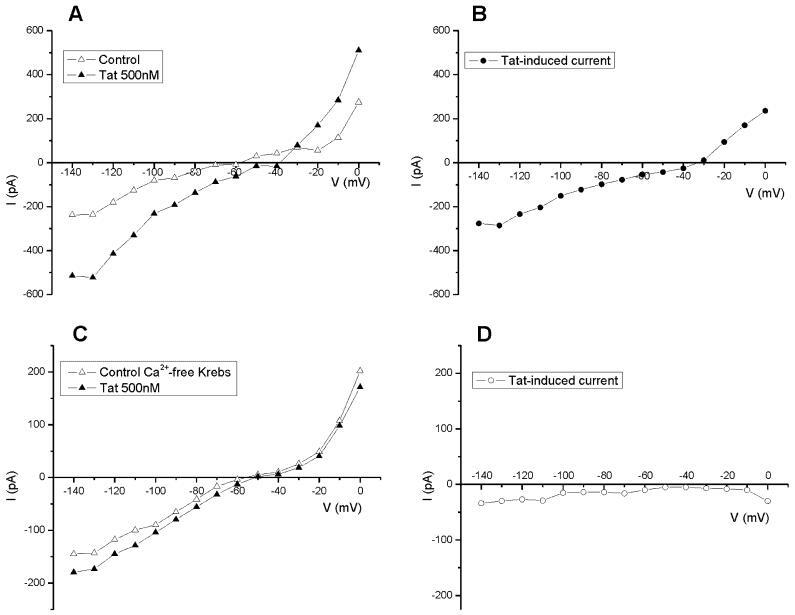 I-V relationship of Tat30-86-induced currents in normal Krebs solution and Ca2+-free Krebs solution. A, steady-state I-V curve before (open triangle, control)) and after (filled triangle) application of Tat (500 nM). B, the reversal potential of Tat-induced current in this neuron was about -30 mV. C, steady-state I-V curve before (open triangle, control) and after (filled triangle) application of Tat30-86 (500 nM) in a neuron perfused with Ca2+-free Krebs solution for 10 min before application of Tat. D, Tat-induced current did not reverse between -140 and 0 mV. The neuron was held at -60mV.